Bonavision and AIbrain, the robotics companies which specialized in research and development in robot, are introducing various app programs such as ‘Make Tyche to dance with computer’ from Dancing Robot, ‘Talk to Tyche in English’ from Talking Tyche, ‘Move as you draw’ from Plan and Move, ‘Remote controlling’ from Remote Communication, ‘Tracking ball,face and arrow from Vision and ‘Do program yourself’ from BYOI. 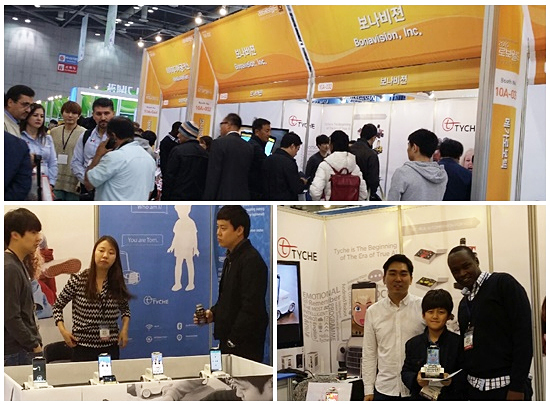 This entry was posted in Tyche and tagged Kintex, Roboworld 2015, Tyche. Bookmark the permalink. ← “A Dollar for Tyche” Kickstarter Campaign for the Children of the Future.